Sound quality! We can’t stress it enough! Remember, while video is important, it’s the audio that brings music and movies to life! Size! It’s ideal for smaller spaces where traditional speaker setups might be physically overwhelming. Wireless low-profile subwoofer offers exceptional placement flexibility. allows high-quality audio streaming from any room in the house. A fabulous 2.1 channel system with Paradigm Virtual Surround offers an immersive surround-sound experience. Action packed movies? Multichannel music? Turn on Movie Mode to get the mesmerizing impact of Dolby Digital material. Switch to Music Mode for a classic 2-channel experience. Bluetooth capability. Stream from a mobile phone or other portable device and charge the device from another room while continuing playback and control from Soundtrack 2’s remote or top-panel controls. Easy-to-use remote boasts a superb fit and finish. Great sound, anywhere! The Soundtrack 2 System is perfect in a main room but it’s equally ideal in smaller spaces and secondary rooms … think family room, bedroom, den, home office, kids’ dorm room at school or even the board room! Direct connection to Apple TV and Airport Express. Qualities and features that put the Soundtrack 2 heads above other soundbar subwoofer systems? Sound quality — a Paradigm Soundtrack 2 is giant sonic step above anything available at a big box store. Paradigm engineering also makes it a better built product — high-power audiophile drivers, a subwoofer boasting performance and power that is far above most other compact systems on the market. Then there are its features: dedicated Music Mode for 2-channel content and a dedicated multichannel Movie Mode showcasing our Paradigm Virtual Surround (see next page for details), Bluetooth capability and Dolby Digital encoding. Who is Soundtrack 2 System for? Anyone who wants audiophile sound in a space-saving format with loads of current technology included and a product that looks as good as it sounds. Includes soundbar and subwoofer with floor cradle, ergonomic remote with 2 ‘AAA’ batteries, wall-mounting bracket and installation template, AC power cord, digital optical cable and stereo RCA analog cable. Right-angle RCA adaptor allows easy access when the sub is placed on the floor in a horizontal position. Four rubber feet are also included to ensure all-important heat dissipation when the sub is placed on the floor in a horizontal position. Stream music from a portable device anywhere in the house. Operates via a full-function remote control or onboard top-panel interface controlling Power, Volume and syncing of the subwoofer. Most TV or satellite remotes can learn Soundtrack 2’s remote. Discrete HEX codes for comprehensive custom integration. Direct hook-up to a TV, cable box, Blu-Ray player, gaming console and other TV accessories. Also connects directly to Apple TV and AirPort Express. Connections can be made via the soundbar or the TV. Inputs: Fiber-optic digital; RCA to RCA; Auxiliary; Bluetooth. Turn on Movie Mode with Paradigm Virtual Surround to experience the mesmerizing impact of Dolby-Digital encoded material. 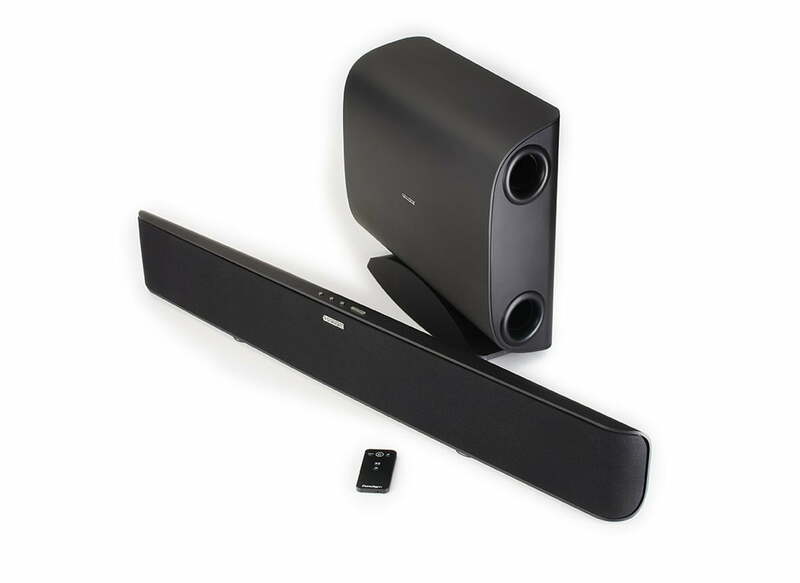 The two full-range driver complements in the soundbar are physically separated into two channels. Two drivers and a passive radiator make up the right channel of the soundbar with the same complement on the left. This separation ensures that sound from both channels travels widely and deeply throughout the room. Stereo imaging is immaculate. Superb reproduction of the original live event or original recording session. If in a live performance cellos were to the left, violas spread across the front, drums in the back, then that’s where you’ll hear them. In a movie, as special effects fly in, you’ll find yourself ducking your head. With a dedicated Music Mode and Movie Mode boasting Paradigm Virtual Surround you can switch back and forth to suit your listening. In a nutshell: This is a small system with very big sonic attributes! Bass/Midrange2 x 4″ bass/midrange woofers: Mineral-filled polypropylene. This material delivers a superb low-mass, high-stiffness ratio. The benefits of this? Excellent reproduction in the higher midrange and fast transient response (explosions, etc.). The material is also an effective damper for distortion as the woofers move back and forth. 2 x 4″ passive radiators: Constructed of a mineral-filled polypropylene, the dual radiators extend the speaker’s range in the lower bass frequencies. 2 x 1″ high-frequency ferro-fluid cooled dome tweeters: Pure-aluminum dome tweeters are a rarity at this price. Fluid cooling the voice coil improves power handling which improves the accuracy, purity and range of the high-frequencies. 8″ laminated polypropylene cone driver with a 1-1/2″ high-temperature aluminum-wire voice coil. Dual ports ensure even, articulate, well-timed bass performance. Oversized ports and driver are arranged in a perpendicular array to achieve the low-profile design. Wired option for subwoofer is also available, cable not included. If desired, the sub will fit into a standard A/V cabinet. Digital Signal Processing in the amplifier not only ensures clean, musical bass performance, it also supplies the processing power necessary for Paradigm Virtual Surround, a surround sound algorithm developed by Paradigm’s engineers. The Class-D amplification delivers 2 x 25 watts of RMS power and 2 x 50 watts peak power from the sound bar. The amplified sub delivers 100 watts of RMS power and 250 watts peak power. Typically, in systems without dedicated surround/rear speakers, all the wonder and magic of surround sound is lost, since there are no actual speaker channels to deliver it. This precious information, carefully mixed by recording engineers in the studio, sits neglected in the front left and right speaker channels. In Soundtrack 2, Paradigm Virtual Surround processing, a proprietary set of algorithms developed by Paradigm engineers, ensures that none of that immersive surround magic is lost. Humans have the ability to hear sound in three dimensions. Through sophisticated mathematical algorithms that capitalize on this ability, Paradigm Virtual Surround processing gathers all the neglected surround sound information in a central sweet spot then reflows it into the front left and right channels, sending it out into the room in a way that creates the auditory illusion of swirling surround sound — in other words, a completely enveloping audio experience. An auditory ‘illusion’ perhaps, to our ears however, this experience is very very real, lifting the audio experience to a realm that is immersive, engaging and magical. – Design: 2 isolated, identical channels for Left and Right. Left Channel: 2-driver, 2-way plus single passive radiator. Right Channel: 2-driver, 2-way plus single passive radiator. Molded ABS enclosure with matte finish. – Crossover: 3rd-order electro-acoustic at 2.4 kHz. – Amplifier: 2 x 25 watts of RMS power and 2 x 50 watts peak power. – High Frequency Driver: 1 x 25-mm (1 in) S-PAL™ satin-anodized pure-aluminum dome tweeter (per channel). – Midrange Frequency Driver: 1 x 102-mm (4”) mineral-filled polypropylene cone, 37-mm (1-1/2”) voice coil (per channel). – Passive Radiators: 1 x 102-mm (4”) mineral-filled polypropylene (per channel). – Accessories (Included): Snap-in stability feet and screws; on-wall bracket. – Design: Single driver, bass-reflex design. Ports are arranged perpendicularly to achieve the low-profile design. Built-in amplifier. Molded ABS enclosure with matte finish. – Amplifier: 100 watts of RMS power and 250 watts peak power. – Low Frequency Driver: 210-mm (8 in) reinforced mineral-filled polypropylene cone, 38-mm (1-1/2 in) voice-coil.